This arched waterfall design is sure to add a unique, stylish feel to your home or business. These are frequently flat on the ends but can also feature domed ends. Choose a valance around the edges to add character or keep it simple and flat for a modern look. Similar to dome style awnings, Quarter-round awnings are a fantastic way to add elegance to your doors and windows. This style is perfect for an entry or long window on your home or business. 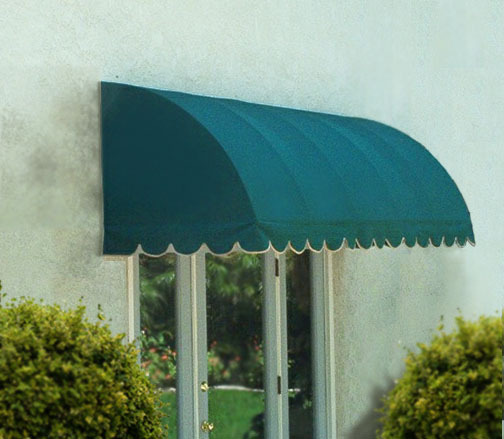 This awning provides shelter from the sun or rain for your customers and guests. We can customize this awning with your company's logo, address, or branding. Like all awnings, when placed correctly a dome style awning can protect your interior from UV and sun damage, and can help lower cooling costs by limiting the amount of direct sunlight entering your home or business. Eclipse Shade: Awnings and more can customize this style to fit your needs and space. Contact us today!